Attack on Titan isn't exactly an adorable anime. But this doggy cosplay sure is. 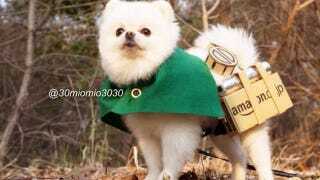 Twitter user 30miomio3030 created an Attack on Titan dog outfit, complete with Three Dimensional Maneuver Gear made from Amazon boxes. Bravo.